One of the things I like most about hosting this blog is the wonderful emails I get from folks sharing their stories of owning chickens. 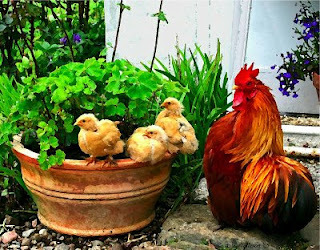 This latest mail is from Anne Tolleson who wrote to share a beautiful album of Ardfenaig Extraoridnary Chickens (that's her picture of Seamus and his chicks on the right). The photo album has some of their 15 breeds and hybrids and each picture is lovingly titled with who's appearing (I love the rainbow of egg colors!). Another reason we love our chickens is that we supply their eggs to the hotel in the village and in return we get a FREE hamburger and Coke once a week. What a deal! They say that our fresh eggs are really popular with the guests and that they taste much better than the ones they buy in the shop. They also would rather buy our free range eggs rather than those from battery hens. We are allowed to bring our sweet Cochin hen, Bella, with us when we stop by for a beverage. She is well behaved and never poops in the pub. Thanks for sharing your album with us, Anne!